Microsoft beat Wall Street's profit forecast on Tuesday, helped by growth in its cloud computing business, but took a US$13.8 billion one-time charge due to the new U.S. tax law. Stock of the world's largest software company, which have risen almost 15 percent over the past 12 months, fell 1.2 percent in after-hours trading. The quarter was the 10th in a row of more than 90 per cent revenue growth for its flagship Azure cloud computing service, which directly competes with Amazon.com's Amazon Web Services. Amazon customers hoping to avoid being locked into one service could be helping growth, said Kim Forrest, an equity analyst at Fort Pitt Capital Group. "If you're really smart you'll have not one provider but two," she said. Revenue from what Microsoft calls its intelligent cloud segment rose 15.3 percent to US$7.8 billion in the company's fiscal second quarter, including 98 percent growth for Azure. Analysts on average had expected US$7.51 billion, according to Thomson Reuters I/B/E/S. Amazon Web Services is the leader of the US$14.4 billion cloud computing market with more than 31.8 percent market share, but Azure has been growing fast and holds the No. 2 position with 13.9 percent of the market, according to 2017 third quarter estimates by research firm Canalys. 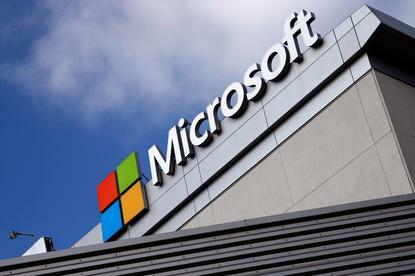 Microsoft's tax charge lead to a net loss of US$6.30 billion, or 82 cents per share, in the quarter ended Dec. 31, compared to a profit of US$6.27 billion, or 80 cents per share, a year earlier. Excluding one-time items it earned US96 cents per share, beating analysts' average expectation of 86 cents. "If they are the only company taking a one time tax write off that would be disconcerting but the fact that nearly everyone is doing it implies it is not a big deal," said Adam Sarhan, chief executive of 50 Park investments, an investment advisory service. Revenue climbed 12 percent to US$28.92 billion, beating analysts’ expectations of US$28.40 billion. Reporting by Pushkala Aripaka in Bengaluru; editing by Bernard Orr and Bill Rigby.